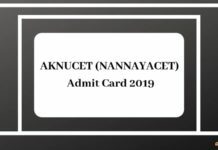 AKNUCET (NANNAYACET) Counselling 2019: Counselling process shall take place in the month of July 2019. The qualified candidates will fill their preferences about the allotment of disciplines or institutions. It is the most important part in the admission procedure as the counseling grants divine opportunity to the eligible candidates for the admission in desired PG programmes offered by the University. Candidates will have to come for NANNAYACET Counselling 2019 along with all the original documents, admit card and receipt of having paid fee. Counseling will take place after the declaration of the result. Candidates are advised to stay updated with us. 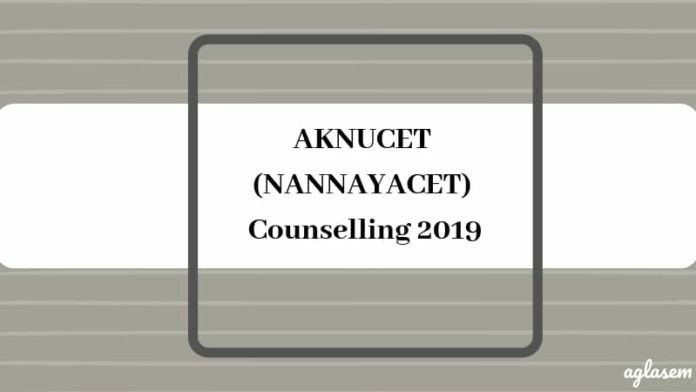 Scroll down to the article below for getting the full information on AKNUCET (NANNAYACET) Counselling 2019. The selection will be recommended strictly on the basis of merit of eligible candidates determined by the rank obtained in the AKNUCET entrance examination. Candidates need to fill their preferences at the time of counseling and the vacant seat will be allotted according to the candidate’s ranking. Counseling: The AKNUCET 2019 counseling will start on www.aknudoa.in. 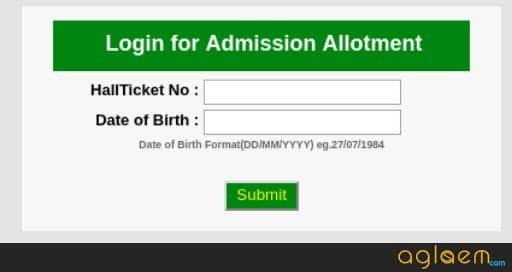 How to fill the seat allotment for AKNUCET 2019? Candidates must go through the steps given below to get to know the procedure of choice filling by log onto the candidate portal of the University. Visit the official website or click on the direct link available on this page. Click on the “Submit” button to proceed further. The Seat Allotment page will appear on your tour screen. Fill the choices as per your preference. Take a print out of the preferences for future references. 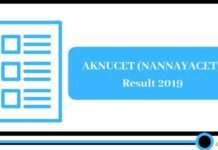 The result for the AKNUCET 2019 shall be released in the second week of May 2019. Counselling process will take place right after the result declaration. All the details regarding AKNUCET counselling will be available on the official website of the University. In counselling, the candidates will have to go for the certificate verification process and after that, filling the web options will begin. Candidates will be allotted seats on the basis of their choice filling and ranking secured by them in the entrance examination. Choice Filling: To fill the choices online, the qualified candidates are required to log onto the official website of the University. Contenders must report on the prescribed date of the counselling with all required original certificates, their photocopies, and Course fee as well. If the candidate gets selected for the admission then the seat allotment will be done on the same day itself. Certificates to be submitted at the time of the counseling: The following information must be kept ready for filling in the details for online submission at the time of admission. Without these documents, the admission procedure will not proceed further. Study or Residence (from M.R.O) or relevant certificate for proof of local status. Cancellation of seats: Candidates can cancel their seats by informing the concerned authorities of the University. There are some certain criteria for the cancellation of seats. Candidates can go through the pointers to get the basic details on the seat withdrawal. 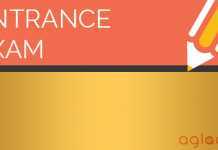 90% refund of the total fee prescribed before the completion of the first phase of the counselling. 80% refund of the total fee prescribed before the completion of the second phase of the counselling. no fee refund after the second phase of counseling.